Through firsthand accounts, Stormy Seas: Stories of Young Boat Refugees offers a glimpse into the life of five refugees from all over the world. After a brief history of persecution dating back to the 1670s, Stormy Seas starts with Ruth, an 18 year old Jewish refugee from Germany in 1939 and travels with four more refugees through time ending with Mohamed, a 13 year old fleeing a civil war in the Ivory Coast in 2006. Through the history and personal tales of these children, it is clear that history repeats itself again and again. Stormy Seas provides invaluable insight into the harrowing experiences refugees face and also into the life and accomplishments that can be had when refugees are given a safe home. 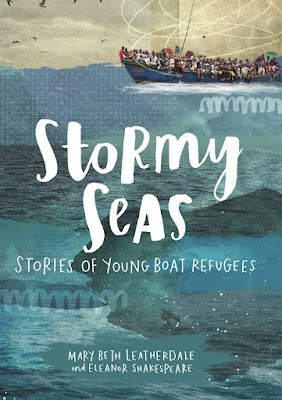 For teachers, Stormy Seas is a great nonfiction resource for any unit on refugees or migration of people. If you’re interested in reading Stormy Seas: Stories of Young Boat Refugees, you can purchase a copy here on Amazon.